Photo= Square's special card reader for credit card payment service (center square portion). When a card is inserted, data, such as the card number, is read when a card is inserted. An increasing number of stores in Kyoto City have adopted the payment service of "Square" a U.S. IT venture company. This service is mainly spreading among sole proprietors who do not have credit card terminals installed as the service facilitates credit-card transactions through "smartphones," or multifunctional mobile phones. It has an advantage due to its initial investment burden being slight; simply plug Square's mini-sized credit card terminal into a smartphone to enable it to read the shoppers' credit cards. 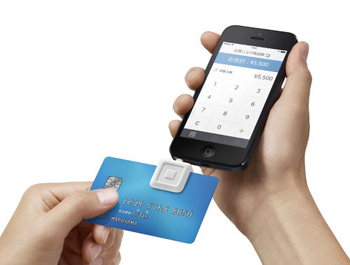 Square entered the Japanese market in 2013 and now has contracts with approximately 50,000 stores in Japan. With 1,400 contracted stores as of late-June, 2014, Kyoto City has the highest participation rate in the Kansai area. It is said that, compared to other cities, a large amount of independently-operated businesses in Kyoto City do not support credit card payments. Square's Japanese subsidiary anticipates that "As the Tokyo Olympics approach, foreign customers will continue to increase, and the market in Kyoto will expand." Intensifying competition with Rakuten, Inc., PayPal Pte. Ltd. in Tokyo and other companies is expected in the future as they are developing similar payment services.